November 12 to 19 marks Australian Pollinator week, which acknowledges our important and unique insect pollinators. 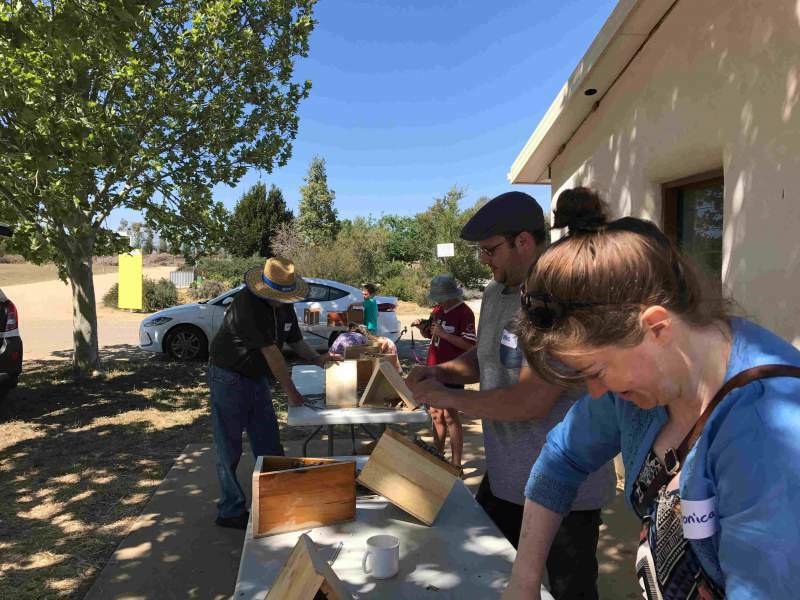 To raise awareness of the essential role of pollinators in our environment and what you can do to support their needs, Watershed Landcare hosted a Native Bee Motel workshop. Presenter Liz Davis, Central Tablelands LLS Regional Landcare Facilitator, guided participants through the building of their own bee motel to take home, as well as highlighting the function of native pollinators to ecosystem services and our environment. Eighteen participants, including 5 children, attended the 2 hour workshop held at the Australian Rural Education Centre (AREC) last Sunday. “It’s great to see children getting involved and learning about the important role native pollinators make to our plants.” said Claudia Wythes, Watershed Landcare Coordinator. “It’s such an easy thing for anyone to make and put in their back yard to provide a home for the native bees.” she continued. The Lucknow Men’s Shed made the boxes for the motels for a series of workshops held across the Central West as part of National Pollinator week activities. Workshop participants used common materials such as dock, carrot weed stems, hemlock and old thistle to fill the boxes and provide lots of nooks and crannies for the native bees to nest in. “Anything that has a hollow core makes a great home for native bees, it’s just a matter of using your imagination and being creative. 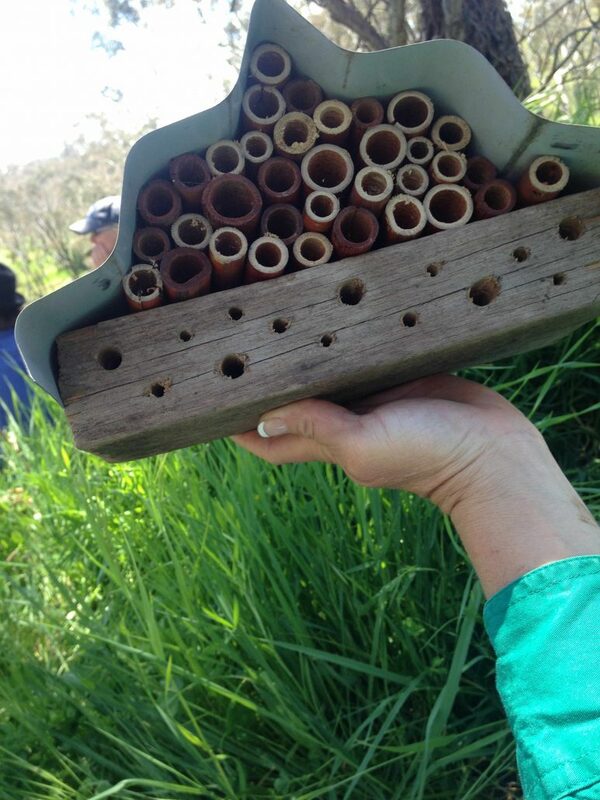 Such a small thing makes a big difference to the population of native bees.” said Ms Wythes. Missed out on the workshop? It’s not too late for you to get involved in National Pollinator week. Despite there being around 2,000 native bee species, as well as a couple of thousand butterfly, wasp, fly, moth, beetle, thrips and ant species, some of which are documented pollinators, very little is known about their ecology, where they are found or what plants they pollinate. By simply watching any flowering plant for just ten minutes you can help to build a picture of wild pollinators in your local environment and help to build a database on wild pollinator activity. To contribute to this citizen Science project visit: wildpollinatorcount.com. The Federal Government has announced the next funding round of the National Landcare Program. From July 2018, the Regional Land Partnerships component of the National Landcare Program will invest $450 million over five years to deliver national priorities at a regional and local level. Central Tablelands Local Land Services is working with Landcare networks across the region to develop partnerships and projects as a basis for a regional bid. As part of the process Central Tablelands staff, Watershed Landcare members, community representatives and landholders, both large and small, will meet on Monday to scope and develop the priorities that are important to us within our region. The consultation session will seek input from our community to identify regionally relevant priority areas, both current and emerging, explore opportunities to address the issues raised, including what solutions may look like and who could be involved, and road test project ideas from participants. Watershed Landcare is always looking for new ideas and opportunities, no matter how small. Do you have any great ideas for ways to innovate, events or projects? Let us know. We’re open to new ideas and things that landcare may not have traditionally done in the past. Want to find out more about Watershed Landcare? Watershed Landcare would like to invite all members and the community to our Annual General Meeting and dinner. The AGM will be held on Friday 24 November at the Straw Bale Shed at the Australian Rural Education Centre (AREC), 6pm for a 6:30pm start. Come along and meet other Watershed Landcare members, find out what we do and how you can get involved. All welcome, but please RSVP by Monday 20 November for catering purposes to Claudia Wythes, Watershed Landcare Coordinator, on 0412 011 064 or info@watershedlandcare.com.au. The Management Committee has decided its time to sell the disc seeder that has previously been hired to members. The Watershed seeder was purchased 10 years ago to promote the use of disc machines for perennial pasture establishment and increased groundcover. The seeder was built by Davimac in Molong with their standard machine fitted with Ausdrill discs. The machine has 10 single discs that allows seed and super to be sown with minimal disturbance to the existing groundcover making it excellent for pasture cropping. For technical questions or to inspect the machine, please contact Bruce Christie on 0429 986 434. Tenders close 5pm Monday 20 November 2017. To celebrate National Pollinator Week, which runs from 12 to 19 November, Watershed Landcare have invited Liz Davis, Regional Landcare Facilitator Central Tablelands LLS, to run a Native Bee Motel workshop. Come along and build your own native bee motel and learn how you can attract these fascinating little creatures to your own backyard, whether it’s a farm, bushland, suburban block or a balcony. The workshop will be held from 9:30 – 11:30am on Sunday 12 November at at the Straw Bale Shed, Australian Rural Education Centre (AREC). The workshop is free to attend for Landcare members and $15 for non members. Booking are essential as places are limited, register your interest by 9 November. All welcome but children must be accompanied by an adult.